This Vegetarian Paella is perfect for those who don´t eat animal products, or simply for those who prefer to take care of themselves without giving up this dish. It is full of delicious vegetables that not only provide flavor but also give the dish a beautiful color. The variety of vegetables can be modified, you can also add any other vegetable that you prefer. You can also use the pulp of 1 or 2 dried and soaked chorizo capsicums, instead of paprika. Which paella rice to use? Read the article at the bottom of our home page! First, wash the tomatoes, cut off the stems and the base and cut them into wedges. Put them in a container with salt and a splash of olive oil and mix. Then set aside. Next heat the olive oil over medium-high heat in a 30 cm frying pan. Add the chopped onion, garlic, paprika, saffron and season with salt. Stir all the ingredients with a wooden spoon and let the onion soften for a few minutes. Then add the artichokes and eggplant to the frying pan, cooking them until they are tender, about 5 minutes. Next, add the mushrooms and continue cooking for 2 more minutes. Then pour in the white wine and lower the temperature until the liquid is reduced by a third. Now add the rice and season with salt. Pour enough water to cover the rice completely, about 2 and 1/2 to 3 cups, and bring it to the boil. Sprinkle with capers and green beans. Then place the reserved tomatoes on top (with all the juices included). Next, lower the temperature so that it cooks over medium heat for 20 minutes. After that time check if the rice is ready, if it needs more cooking, add more water and cook for a few more minutes. Lastly, place the piquillo peppers in strips on top and cover the frying pan so that it rests for another 10 minutes before serving. 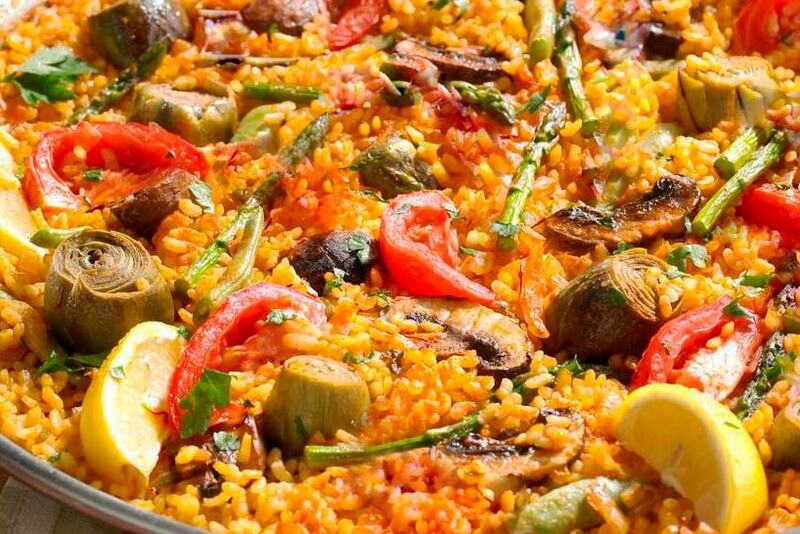 How easy was this Vegetarian Paella? Of course, this paella is Vegan-Friendly. Perfect for those who don´t want to eat animal products or simply those who want a lighter meal but still enjoyable!